Janie Bress - My North Shore Blog: Experience the Arts in Highland Park This Weekend! Experience the Arts in Highland Park This Weekend! One of the things I thoroughly enjoy about being a North Shore Real Estate agent is being a part of the vibrant communities throughout the area. The North Shore cities of Winnetka, Deerfield, Northbrook, Highland Park and Glencoe are committed to supporting local businesses, schools and residents, and have regular events that highlight the unique aspects of their community. Throughout my years of experience in the North Shore Real Estate market, I know that buyers are not only looking for a beautiful North Shore home, but for the North Shore lifestyle. Aware of this, I always try to get to know my clients and what they’re looking for in a community. I will then give them insight in to each of the North Shore areas so that they’re able to get a vision for what life is like and can choose which city best fits their lifestyle. For those of you who are considering moving to the North Shore and love the arts; Highland Park may be the community for you! The Art Center of Highland Park has been a staple artistic outlet for the past 50 years and has encouraged the growth of young artists. 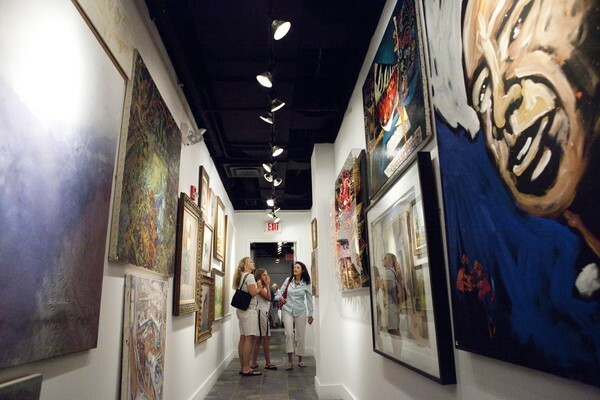 This non-profit provides classes for residents interested in art no matter what their level of experience, as well as regular art exhibits for everyone to enjoy. If Highland Park sounds like a place you’d like to call home, or you currently live in Highland Park and are looking for something to do this weekend; you won’t want to miss two new exhibits opening at The Art Center of Highland Park! - Attend the opening reception for the Arts of Nepal this Friday at the Art Center of Highland Park! This free event will feature authentic Indian-Nepal foods and beverages from local restaurant, Himalayan. The tastes of Nepal will enhance the experience of the exhibit which highlights the work of Nepali artists. Mixed media pieces and paintings will be on display from local artists as well as those living abroad. If you can’t attend the opening, the Arts of Nepal exhibit will be showing at The Art Center of HP from March 2- April 5. For more information, view The Art Center of Highland Park’s website. - This unique photography exhibit showcases works that relate to the idea of Kin: someone or something of the same or similar kind. KIN presents photographs that depict the ties of family, neighborhood, sports and music within the youth culture. You won’t want to miss this culturally relevant exhibit which will be at The Art Center through April 5. Learn more at The Art Center of Highland Park’s website. If you’re interested in moving to The North Shore and looking at Highland Park; I hope you’re able to take advantage of these events this weekend! This can be a great way to get a sense of the Highland Park community and allow you to mingle with its residents. I would love the opportunity to talk with you if you’ve been considering buying a North Shore home. There are many stunning homes currently on the North Shore Real Estate market that I would be happy to show you! If you have further questions about living in the North Shore or are ready to get started in your home search; feel free to contact me today!